Indian Cuisine Tutorials: Punjabi Cuisine - Butter/Makhani Gravy - Simply Fahad-istic! This is Post No. 6 in Indian Cuisine Tutorials series.A new one each day! 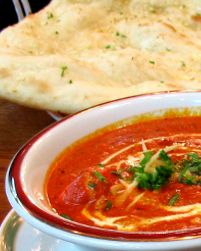 The gravy of butter chicken,called Butter Gravy or Makhani Gravy,is chiefly made with tomatoes.Fresh tomato puree or paste is slowly simmered with green cardamoms,cloves,cinnamon,garlic paste,ginger paste,red chili powder,salt,pepper and of course,butter!In case chopped tomatoes are being used instead of puree/paste,the gravy must be passed through a sieve later to be made smooth.The sourness and tartness of tomatoes is reduced by cooking slow cooking,for a long time and adding cream towards the end of cooking process.Some cooks also like to add cashew paste.Not only does it give a subtle sweetness to the gravy,but also makes it thicker and creamier.If still sour,honey or sugar is added.One of the unmissable ingredients of this gravy is dried fenugreek leaves,providing it a distinct flavor as well as aroma. 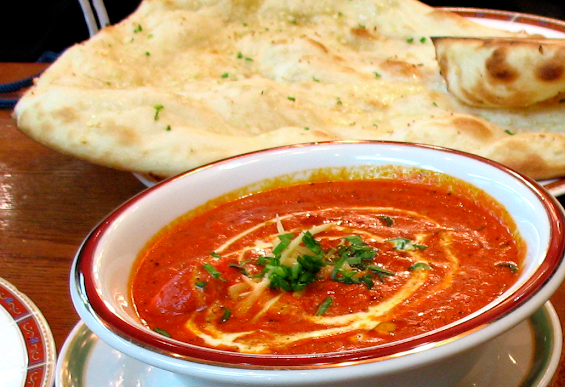 Add paneer to butter gravy instead of tandoori chicken,and you get Paneer Makhani,the vegetarian version. No credit or ownership is claimed of any images/pictures used in Indian Cuisine Tutorials series unless stated.Images/pictures have been obtained over the internet and due care was taken before using them to ensure that they were free for commercial use/royalty free or belonged to public domain.In case of images/pictures free for commercial use/royalty free,link back to the sources and attribution have been given.The owners of these images/pictures do not endorse the author or the blog. If anyone has any issue with the images/pictures posted here,please contact us and we can remove the offending post. A believer in the ideology of Live And Let Live,Food Blogger,Restaurant Critic,Ex Restaurant Manager,Tarot Card Reader,Philosopher,Animal/Human Rights Advocate.